With an objective of keeping a watch on the performance of various administrative secretaries and heads of department with regard to the progress of work on various projects and programmes, the government has decided to introduce the “bar chart” system. A Damocle's sword is hanging over as many as 121 ex-servicemen, including 27 widows, who have defaulted on money lent by the Punjab Finance Corporation (PFC) 20 years ago and the latter has warned them to return it by January 31 or their ancestral properties will be attached. These ex-servicemen are among the 680 who borrowed money from the PFC under the the Self-employment for Ex-servicemen Scheme in 1988 for starting transport business post retirement. Family members of defaulter Punjab police sub-inspection (SI) Sukha Singh allegedly misbehaved with two PSEB employees who had gone to his house in Friends Colony to disconnect his power connection yesterday evening. The SAD-BJP alliance here today claimed to have conveyed the sentiments of the Sikh masses on the contentious issue of sporting of turbans by Sikhs in France to the visiting French President Nicholas Sarkozy. 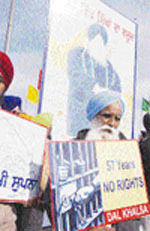 President of the SAD (A) Simranjit Singh Mann, today chose Gwalior to register his party’s protest against the French Government. Sukhbir Badal, acting chief of the SAD, today put speculations about succeeding Parkash Singh Badal as Chief Minister at rest by announcing that his father would complete the term. In response to the activists raising objections over the RTI Rules, notified recently by the Punjab government, a full Bench of the Punjab Information Commission has issued notice to the Secretary of Administrative Reforms department asking it to reply to the issues raised in this regard. 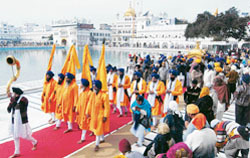 The Sikh clergy, at its emergency meeting here today, rejected the controversial “hukamnama” (edict) , pronounced by Sikh high priests of Takht Patna Sahib, challenging the “maryada”( Sikh tradition) and Nanakshahi calendar , approved by the SGPC and Akal Takht . The Punjab government has decided to make tillers land owners. The government land on which tillers have carrying out farming for decades will now be allotted in their name. “The girl child should be welcomed in a family in the same way as a male child,” said Capt Kanwaljit Singh, minister of cooperation, Punjab, while inaugurating a symposium on “Girl Child - A Fight for Dignity”, organised by Panjab University Centre for Adult, Continuing Education and Extension, here today. With the aim of providing medicines at lower prices than market rates to patients, the state will offer shops in all civil hospitals to private players and NGOs following competitive bidding of lowest rates among them. Sikh history seems to have come full circle! The marriage of the son of Baba Ram Singh, former chief of the Akhand Kirtani Jatha, who was born at the time of Sikh-Nirankari clash on April 13, 1978, was solemnised at the site where the tragedy, in which 13 Sikhs were killed, took place 30 years ago. Delivering the keynote address at the programme “Awas-Parwas”, organised by the district education office (secondary), at a government senior secondary school here, president of an NGO, Scientific Awareness and Social Welfare Forum, A.S. Mann said there was nothing wrong in going abroad, but one should understand that dollars in foreign countries could only be earned by working very hard in the fields, restaurants and factories etc there. Two Punjab cadre IPS officers, Anil Kaushik, ADGP, Security, and Paramjit Singh Gill, DIG, Patiala Range, have been conferred the President’s Police Medal for distinguished service. Less than a fortnight after Justice Rajesh Bindal of the Punjab and Haryana High Court referred Punjab’s former Chief Minister Capt Amarinder Singh’s plea for blanket bail to the Bench of Justice Ranjit Singh, the latter declined to hear the matter due to changed roaster. Issuing notice of motion to Punjab and other respondents, a Division Bench of the Punjab and Haryana High Court comprising Chief Justice Vijender Jain and Justice K.S. Ahluwalia today directed maintenance of status quo on a petition against encroachment on the road leading from National Highway No. 1 to Nabha via Tarkhan Majra-Bhadson in Fatehgarh Sahib district. Extreme cold, coupled with lack of soil nutrients, has upset farmers in several parts of the state, who are worried about suffering huge losses. The Punjab government has reviewed the suspension of former DGP S.S. Virk and has decided to extend his suspension. The decision was taken yesterday at a high-level meeting. This comes a few days after the Punjab and Haryana High Court while ordering a fresh inquiry into the allegations against Virk refused to hand over his case to the CBI.